On paper, residents of Kat Hing Gardens, a cluster of small village houses near Kam Sheung Road railway station in Kam Tin should have a phenomenal view – one of sprawling wetlands full of waterbirds and rare butterflies. After all, the then Kowloon-Canton Railway Corporation (KCRC) had built them to compensate for 12 hectares of natural wetland between Kam Tin and Yuen Long that was permanently lost during the construction of the Kam Sheung Road section of the West Rail Line. The reality however, is a fragmented collection of swamps, isolated from functional wetland systems. Some of them wither in the shade of the viaduct. Most measure just a few thousand square feet and are barricaded from the public by a hostile wall of steel and wire fencing. Apart from mosquitoes, there is minimal life. There are even times when the wetlands are not even wet at all. “This was just compensation for the sake of compensation,” said Dr Ng Cho-nam an associate professor of geography at the University of Hong Kong. “It is meaningless. The West Rail was the first large-scale project to require a managed wetland compensation project under the requirement of the project’s environmental permit, which was based on approval of its environmental impact assessment (EIA). The example has entered Ng’s educational canon – he teaches EIA at university – as a classic case of short-sighted ecological mitigation and compensation planning as well as the shortcomings of the impact assessment system. “I bring all my students here on field trips,” Ng said. The West Rail was built more than a decade ago. But as development projects across the city get bigger, more complex and political, critics have raised questions. Calls for an overhaul of the EIA system have been growing in recent years, with lawmakers on the environmental affairs panel of the Legislative Council demanding that a complete review of the 18-year-old EIA Ordinance be placed on their discussion agenda this term. “The weakest components of the EIA system are mitigation measures for ecology and the environmental monitoring and auditing [EM&A],” said Dr Michael Lau Wai-neng, assistant director of conservation at WWFHong Kong and a member of the Advisory Council on the Environment, which must vet EIA reports and make recommendations to the government. He was referring to the chapter of the EIA technical memorandum that requires “verification of predictions or measures” to mitigate environmental impacts upon completion of the project. Coming under intense public scrutiny in recent years has undoubtedly been the city’s HK$141.5 billion third runway  system. It is Hong Kong’s biggest infrastructure project since the new airport was built. Activists have slammed the issuing of an environmental permit to the Airport Authority as a breach of “procedural justice”. The EIA, they claim, had left several environmental and ecological questions unanswered but had still been approved. A judicial review over the decision was recently thrown out by the High Court. The judicial challengers believed there had been a lack of immediate mitigation measures in the EIA to compensate for the more than 650 hectares of permanent habitat loss – mainly to the protected Chinese white dolphin. Issues such as the accumulative impacts from surrounding projects such as the bridge connecting Hong Kong, Macau and Zhuhai had also been ignored. One of the 250 mitigation measures was the creation of an enlarged protected marine park for dolphins – but only when the project was completed in 2023. The authority’s experts claim displaced dolphins will come back eventually but conservationists believe this is “wishful thinking”. The project was delayed after the Court of First Instance ruled the assessment failed to meet the government’s own standards in 2011. But the government appealed and the ruling was overturned by the Court of Appeal. Chinese white dolphin numbers in northern Lantau have tanked since construction work began in 2011, driven to waters further away or to death by deafening noise pollution and declining fish stocks. From an average encounter rate of 7.7 sightings per 100km in 2011, the figure dropped to just 1.4 in 2015. Their abundance in north Lantau has nearly halved since 2010. Since 2015, the number of dolphins seen in northern Lantau waters has fallen by 60 per cent. “The [bridge project] pretty much opened the Pandora’s box of easy to pass EIAs,” said Hung. His theory, he claimed, had been confirmed by the judicial decision on the runway EIA. Since the ordinance was introduced, the director for environmental protection has received 240 EIA reports. Of these, 38 had failed to either meet certain criteria or were withdrawn before consultation. Just one was rejected. “There are too many interests involved in EIAs,” said Dr Billy Hau Chi-hang, a University of Hong Kong ecologist and a member of the Advisory Council on the Environment, who has been calling for a review of the system rather than the ordinance. “In this political environment there is always the chance of political manipulation. Even if a review of the ordinance is conducted, will it actually strengthen it?” he said. Because most designated projects are proposed by the Hong Kong government, Hau believed it would be difficult for a director, who was also a member of the policy bureau, to split his professional and political roles in making decisions on EIAs. The perceived conflict of interest is most apparent when it comes to government projects – the planned controversial waste incinerator on Shek Kwu Chau, for instance, was floated by the Environmental Protection Department, the body that would scrutinise and approve its EIA. Those involved in EIAs, however, are quick to defend the system and brand much of the criticism as “unfair”. Built on the backs of those in the Netherlands, Australia and Canada, the system is hailed as a pioneering development for Asia that helped inspire others. Introduced in 1998, the EIA Ordinance was seen as a way to avoid, minimise and control adverse environmental impacts from designated projects through a thorough process and a permit system. The principles were avoidance, minimisation, compensation and enhancement. “The process has been shown to be solid over 18 years. It works, it has given the accepted result that they wanted in the legislation, and the professionalism has increased, I would say, by an order of 10,” said Dr Glenn Frommer, a former head of corporate sustainability for the MTR Corporation , who helped develop the assessment for the airport railway project in the early 1990s. Clara U Kam-wa, chairwoman of the Hong Kong Institute of Environmental Impact Assessment and a senior assessor with the Environmental Protection Department, points out that over 200 EIAs have been approved since the ordinance was implemented and many developments in environmental engineering and design were adopted after being put through the EIA process. She did not believe there were conflicts of interest in the department’s dual positions as all EIAs were assessed strictly according to the technical memorandums. “There have been so many hidden successes and unexpected consequences [of EIAs],” U said. She pointed to the influence of the Lok Ma Chau Spur Line project in altering engineering preferences from tunnels to viaducts and the evolution of excavation works to favour non-dredging methods. In 1998, an EIA study brief set requirements on greenhouse gases at a time when climate change was not as hot a topic, influencing a decision by applicant HK Electric to opt for a gas-fired generating facility in its extension to the Lamma Island power station. Frommer highlighted two fundamental developments over the decades that EIAs will have to keep up with: the “de-siloisation” of issues set out in the memorandums and the evolution of public participation in the EIA process. “We’re now seeing more connections between air, noise, water, waste, agricultural risk, chemical usage issues,” he said. A frequent criticism of the ordinance has been the lax public engagement requirements. A project proponent, for instance, is only required to consult the public and advisory council on project profiles for 14 days and on their EIA reports for one to two months. EIA scholars are relatively more sanguine. Ng of HKU supports “mitigation banking” – a system similar to carbon banking in which habitat loss from one project is banked as credits and used for off-site mitigation somewhere more feasible. Hong Kong’s High Court has struck out a bid by a Lantau resident and a conservationist to challenge the decision to allow the construction of a third airport runway, with a judge rejecting accusations that the environmental watchdog had ignored airspace issues and habitat destruction. Mr Justice Anderson Chow Ka-ming stated in a judgment handed down on Thursday that the grounds of the applicants’ judicial review were not well-founded or valid. The Airport Authority, a party to the case, said it welcomed the ruling and would reduce the environmental impact of the project. In March 2012, the government decided to proceed in principlewith plans to expand the Hong Kong International Airport by building a third runway. The director of environmental protection in November 2014 then approved an environmental impact assessment report and granted a permit for the controversial project, which is expected to cost HK$141.5 billion. But Lantau resident Ho Loy and conservationist Yu Hin-pik applied for a judicial review over the department’s decision, questioning whether it had taken into account the full impact of the runway. In his judgment, Chow wrote that when it comes to deciding whether to grant or deny an environmental permit, it was not part of the environmental watchdog’s functions to vet the wisdom of the Airport Authority’s proposal to expand the airport. “[Its] function is to consider the assessment and acceptability of the environmental impact which may be caused by the project,” the judge stated. Ho also questioned the assessment of noise and air impact due to the use of airspace in the Pearl River Delta area in relation to the projected air traffic movements in or out of Hong Kong. But the judge said it was clear the airspace issue was not relevant to the project’s noise impact assessment or the protection of the environment – which were the watchdog’s areas of concern when deciding on granting an environmental permit. Ho claimed that she had not intended to challenge the decision to build the third runway, and that the present review was related to the environmental impact assessment exercise. She argued that the watchdog’s report failed to take into account the actual ecological impact on the Chinese white dolphin and also failed to provide compensation measures for the progressive permanent destruction of habitat during the construction phase. Chow, however, found it “incorrect” to suggest that the watchdog had failed to consider compensation measures, adding that findings in the department’s report concerning the habitat loss should be read in their proper contexts. The director’s approval of the assessment report depended on criteria including whether it complied with the requirements of a technical memorandum. “I am unable to see in what respect it may be said that there are omissions or deficiencies in the [report] which may affect the results and conclusions of the assessment,’’ Chow wrote in his judgment. The court’s primary concern was with the procedure to be followed in the environmental impact assessment process, not the merits, unless it was found to be unreasonable, the judge added. Chow said compliance with the express obligations imposed by the Environmental Impact Assessment Ordinance should be regarded as a sufficient discharge of the watchdog’s duties in the environmental impact assessment process. “[The] court should not readily impose additional obligations on the director over and above what is expressly required by the ordinance,” Chow stated in the judgment. He asserted that the viability and sustainability of the project was related to the airport authority’s wisdom in pursuing it. This made it a matter of public policy, and not a matter for determination in the present judicial review, he added. Ho and Yu were ordered to foot the legal bills of the director of environmental protection and the airport authority on Thursday, but Ho said she was still studying the judgment and would make public her next step. Two activists lost their legal challenge on Thursday to prevent the construction of the Hong Kong International Airport’s third runway. The High Court dismissed their judicial review. The two applicants, Lantau resident Ho Loy and member of Green Sense Yu Hin-pik, argued that the environmental impact assessment conducted by the Environmental Protection Department was flawed, as it did not provide a sufficient evaluation of the project’s ecological impact. The third runway project was proposed by the Airport Authority in 2010 because of increasing traffic at Hong Kong’s only airport. The plan included reclaiming 650 hectares of land north of the airport for the third runway, as well as expanding the existing Terminal Two for immigration clearance. The applicants said the assessment failed to offer off-site mitigation measures regarding the loss of habitat by Chinese White Dolphins. However, Mr Justice Chow said the report already included a list of mitigation and compensation measures to avoid and reduce potential environmental impacts, such as the designation of a new marine park. The activists also said that noise estimates and the predicted impact to air quality was based on information provided by the Airport Authority and the assumption that the mainland will open up its airspace. The judge said the Civil Aviation Department consulted expert opinion and relevant data to confirm the authenticity of the assumptions and data. The proposed third runway. Photo: GovHK. Mr Justice Chow said that the court only had to rule on whether the assessment by the city’s environmental watchdog had followed due procedures – not to examine the “Airport Authority’s wisdom in pursuing the project”. In August, protesters held a demonstration at the airport in response to the construction of the third runway. They called for the Airport Authority to suspend land reclamation work and to stop charging passengers as a means to subsidise the project. The Authority said they welcomed the ruling and will continue implementing the mitigation measures according to the environmental impact assessment and permits. According to Apple Daily, the applicants are currently looking into the judgment and will not rule out the possibility of filing an appeal. Green Sense said in a statement that they were “very disappointed” with the court’s decision. Dozens of protesters gathered at Hong Kong International Airport yesterday in a final show of force against the Airport Authority’s contentious multibillion dollar third runway project – a day ¬before new passenger surcharges and initial groundbreaking work for its construction begin. Led by environmental activist groups Green Sense and the Airport Development Concern Network, alongside other green and political groups, protesters gathered in the arrivals hall and took turns speaking out against the HK$141.5 billion project. Security was tight as protesters brandishing placards and banners marched through the hall chanting “shame on the Airport Authority” and “white elephant”. One conservation group held up a mock dolphin covered in fake blood to illustrate the hundreds of hectares of marine habitat that will be lost to reclamation. The groups accuse the authority of pushing forward with the project before they had properly assessed the impact on the Chinese white dolphin. 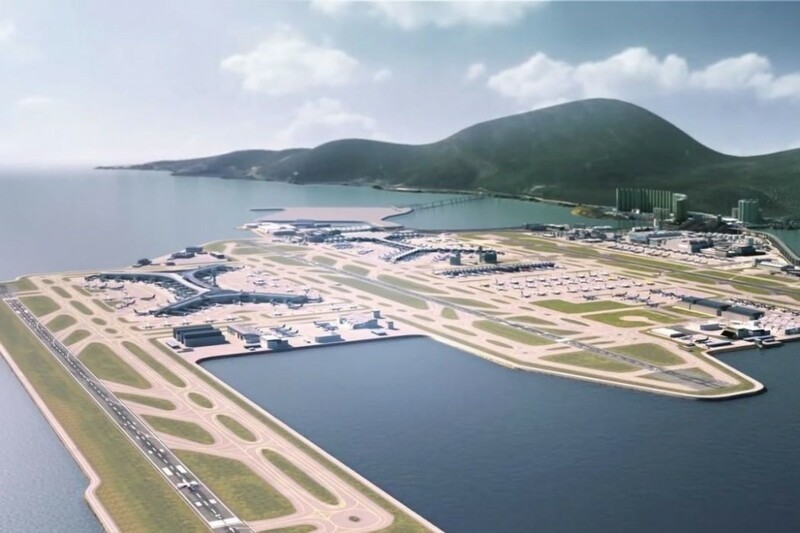 More than 650 hectares of sea north of Chek Lap Kok – much of it prime marine habitat used by the Chinese white dolphin – will be ¬reclaimed for the project, which also comprises support facilities and a new passenger building and apron. Initial reclamation work was expected to begin today, along with the introduction of a new set of ¬passenger fees to help pay for the works – despite a pending judicial challenge. “We are mourning Hong Kong’s environment. We are mourning the dolphins. We are mourning Hong Kong’s loss of procedural justice,” said the ¬concern network’s Michael Mo Kwan-tai, who vowed to “fight to the end” and to physically block work from starting if necessary. Green Sense chief executive Roy Tam Hoi-pong said the last chance to stop the plan was a judicial review, which the authority had already “disrespected” by rushing ahead with work before a court judgement had been made. “If the judicial review calls for work to stop, how will the Airport Authority refund the people who have paid the surcharge? Or those who have paid who are not from Hong Kong?” Tam said. The Environmental Protection Department’s decision to issue a permit to go ahead with construction, despite the unresolved issues, has been the focus of the judicial challenge. Four days of hearings were completed in July. Under the new fee scheme, ¬departing passengers travelling in first or business class on long-haul flights will pay HK$180, while those travelling in first or business class on short-haul flights will pay HK$160. Long-haul flight passengers in economy class will also pay HK$160, while those on shorter flights will pay HK$90, unless they are in transit or transfer, in which case, they will pay HK$70. The fee will apply to all passengers who buy tickets from August 1 onwards. A spokesman for the Airport Authority said the court had made it clear it was legally entitled to charge passengers for the project. But the spokesman refused to comment further on the legal challenge as it had entered judicial proceedings. It was understood the authority would hold a private groundbreaking ceremony at its North Satellite Concourse today. Kai Tak, Hong Kong’s first international airport, had a fearsome reputation. Nestled on the western side of Kowloon bay and just south of significant mountains, an approach to the South-Easterly runway was not for the faint-hearted and many airlines entrusted the task only to Captains. Known to regular flyers as the ‘Kai Tak Heart Attack’, an instrument approach guided aircraft directly towards Lion’s Rock, the procedure demanding a 50 degree turn at low level to seemingly glide between residential towers and onto the tarmac. Another few minutes straight ahead and the cockpit would come alive with flashing lights and bleepers going off for imminent terrain contact. Whilst an aircraft spotter’s dream, the location had very real limitations including no ability to land in low visibility in one direction. This necessitated a move to its current location, Chek Lap Kok, where a pair of parallel runways clear of obstructions and terrain allow the most limiting of approaches and in almost any weather condition. But Hong Kong International Airport (HKIA), once considered as having ample capacity, has since become dwarfed by concrete monsters like Amsterdam Schiphol and Chicago O’Hare, where upwards of five runways allow more than one hundred aircraft to land every hour. Movements, which describe both take offs and landings, measure the pulse of high-performing airports. They indicate efficiency, capacity, and effects of delays, but are eventually limited by the fairly reasonable safety precaution that aircraft can only be packed so close together until they become a hazard. In most cases, this actually means 3 nautical miles on the final approach – which, although safe, leaves little room for mistakes or a myriad of real-world contingencies. In 2008, the Airport Authority Hong Kong (AAHK) decided it was time to expand and commissioned a series of reports to draw up a ‘masterplan’ for the airport. The UK’s National Air Traffic Services (NATS) was asked to investigate ways of further developing the airport. The two phases of reports made recommendations for Air Traffic Control (ATC) operational improvements and investigated airport designs. Starting with 16 options, these were eventually narrowed down to three possible ones, all of which represented variations on a third parallel runway. NATS identified that, staying with the current architecture, HKIA would be constrained to 68 movements per hour, but by adding a third runway this could increase overall movement capacity to over one hundred. However, pinning down the exact financial benefit is tricky – measuring direct and even indirect revenue made by the airlines and airport business may be straightforward, but the subject soon becomes muddy when extrapolating value added by tourism, trade and business development. An economic impact study commissioned by HKIA made the most complete assessment and found that the combined direct, indirect, and induced value-added impact of aviation-related businesses in Hong Kong and non-aviation businesses at HKIA was HK$77,587 million in 2008, equivalent to 4.6 percent of Hong Kong’s GDP. The study then modelled three scenarios including maintaining the status quo, optimisation of the two runway system and building of a third runway. The status quo remained competitive until 2015 whilst optimisation becomes constrained by projected demand in 2020. The third runway system was forecast to increase value-added by HK$167,472 million and maintain its present contribution to the GDP. City states are uniquely bonded to aviation and none more so than Hong Kong, whose history has been so much augmented by air travel. Too often though, construction and bolstering infrastructure seem to be ready answers offered up a little too freely. There is no doubt that development of the airport would add to its capacity, but movements don’t necessarily represent the full picture. Compared to even a couple of decades ago, modern aircraft are able to carry phenomenal numbers of passengers and cargo, yet the International Air Transport Association recently found that, in the year leading up to April, Asia-Pacific passenger aircraft were flying at an average load factor of 77.3% – that means more than a staggering fifth of seats are going empty. That’s not to mention that between 2am and 6am, an average of only 9 aircraft depart from HKIA every hour. If airlines, or more precisely, paying customers were prepared to put up with anti-social timings, then capacity between these hours could almost treble. During daylight, a third runway may allow for more movements, but whether these could be utilised is another matter. Airspace around Hong Kong is unique in being restricted by Chinese airspace to the North, both in terms of space and its vulnerability to mainland delays and air traffic flow control. In June, FlightStats reported that HKIA had placed 37th out of all ‘global-hub airports’ with 34% of all flights experiencing delays longer than 15 minutes. Many were attributable to knock-on delays from the mainland, circumstances which Hong Kong’s ATC can do very little about and which have the potential to choke an airport, especially if movements were to increase by another 50%. Airlines may choose to reroute and avoid Chinese airspace but, for many destinations, the cost implication would be severe. Still, there is a bigger question concerning Hong Kong’s middle-distant future. The Greater Pearl River Delta region presently has five international airports: Guangzhou, Hong Kong, Macau, Shenzhen and Zhuhai. Last year more than 173 million passengers found themselves passing through one of these airports and even more can be expected as the area grows. Over the next six years, rail and road infrastructure projects will begin unifying this area under the cunningly-named “Turn The Pearl River Delta Into One” scheme, creating a super-city 26 times the size of Greater London. In this context, it seems doubtful that, geographically speaking, Hong Kong would be a preferred port of entry for this super-city, making any expansion of its airport unnecessary. Whatever the future holds for Hong Kong, there’s a general feeling amongst the aviation community that this extra runway will add little benefit. Delays in June averaged 62 minutes – without addressing the direct causes by relaxing Chinese airspace and making significant changes to the ATC environment, this runway will find itself redundant. Air travel was once indispensable to Hong Kong. It lubricated trade and pumped life into business, but its importance is proportional to the territory’s isolation. Times have changed. If money must be pumped into construction, it would be better spent establishing stronger links to the mainland – where the future, for better or worse, must lie. Hong Kong is not alone in wanting a three-runway system. Its neighbour Shenzhen is now preparing for an airport expansion, and this is posing a challenge for our cross-border coordination in at least one key aspect – the environment. After several years of turnover growth, the Shenzhen Airport Group has just completed its second and last round of consultation for an environmental impact assessment for reclamation of 439 hectares of land, for the purpose of building a third runway. This reclamation is smaller in scale than the one proposed by Hong Kong for its own third runway (650 hectares). Regardless, the two reclamation projects are too close – only 32km apart – and are likely to threaten the habitat of the Chinese white dolphins, as well as compromise the water quality and long-term carrying capacity of the Pearl River Delta estuary. As close observers of marine construction projects and their cumulative impact, we are alarmed by this unprecedented estuary-wide “reclamation contest”. Shenzhen airport’s ambition accounts for only a quarter of the near-term reclamation, or equivalent to a mere 8 per cent of the sea-to-land conversion blueprint of the special economic zone. Other cities including Zhuhai ( 珠海 ), Huizhou (惠州) and Guangzhou all have their own greedy plan of “asking for land” from the waters. We’re not even counting the massive reclamation for the bridge connecting Hong Kong with Zhuhai and Macau, or the 350 hectares reserved for Macau’s new town development. The question is: where is the limit of reclamation? Several procedures must be completed before Shenzhen airport can break ground for its expansion. These include disclosure of the environmental impact assessment report, a public hearing, submission for state-level approval and an assessment of social stability risk. We don’t know how long these proceedings will take, nor how much of Hongkongers’ concerns will be taken into account. There’s a good chance Shenzhen’s third-runway construction will overlap with Hong Kong’s, and this will exert greater pressure on seawater quality. We don’t deny an airport plays a significant role for a city. The question is: where is the limit of reclamation and who may be qualified to set it? A lack of coordinated environmental planning has long plagued the Pearl River Delta. The ties between the Hong Kong and Guangdong governments are mostly limited to economic collaboration, with little effort spent on cross-border environmental improvement. We urge Hong Kong’s Environmental Protection Department to establish a communication channel with the Shenzhen Oceanic Administration and its Human Settlements and Environment Commission to obtain information on the anticipated expansion period of Shenzhen airport and its study of cumulative impacts. The two governments must work out a schedule that can protect the environment. Hong Kong should share with the Shenzhen authorities the lessons it learned about the negative impact of reclamation, and the use of its Protection of the Harbour Ordinance in limiting damage. Hong Kong went on a reclamation spree in the 1980s and 1990s. Shenzhen, where housing prices are at historical highs, now intends to boost its land supply in a similar approach but has little knowledge about the long-term costly payback. Hong Kong must not shirk its regional responsibilities and must take part in delta initiatives such as the strategic environmental impact assessment inaugurated by China’s Ministry of Environmental Protection last October. The assessment, led by Beijing with the involvement of Guangdong, was created to evaluate the overall carrying capacity of our delta and develop planning strategies for estuary conservation and pollution control. Pollution has no respect for borders, as shown by the recent rubbish surge in Lantau waters. Unless it takes the initiative with the mainland, Hong Kong has no hope of improving its environmental quality. The city’s environmental authorities have outlined “enhancement” measures aimed at compensating for marine habitat destruction in assessing the impact of a proposed third runway at Hong Kong’s airport, the High Court heard on Thursday. These measures would be a “bonus” on top of original impact mitigation plans, barrister Ben Yu SC said. On the third day of a four-day legal battle over an environmental impact assessment for the runway project by the Environmental Protection Department, Yu, who was representing the department, said the outlined enhancement measures were required conditions for approving the controversial construction plans, which are expected to cost HK$141.5 billion. The lawyer cited the promotion of environmental education and eco-tourism and the development of a sustainable fisheries industry as examples of marine habitat enhancements laid out in the department’s assessment report. These would create additional benefits, given that advanced drilling and construction methods would also be used to minimise and mitigate environmental damage, Yu said. But Lantau resident Ho Loy and conservationist Yu Hin-pik, who are seeking a judicial review of the department’s decision to approve the new runway, questioned whether the enhancement measures were legally binding. They also queried the authorities’ willingness to try to restore the marine habitat near the building site to a state as close as possible to that present before construction. They pointed to a lack of immediate mitigation measures to compensate for the irreversible loss of more than 650 hectares of marine habitat, mainly for the Chinese white dolphin, as the authorities are only offering an enlarged marine park when the runway project is complete in 2023. On issues such as the assessment of noise produced by the new airstrip, Yu noted the environmental department had adopted time-proven methodologies in collecting data and projecting the possible noise footprint of aircraft. The procedure complied with statutory requirements, the lawyer argued. The hearing will end on Friday before High Court judge Mr Justice Anderson Chow Ka-ming. A four-day judicial battle between activists and airport officials over the contentious third runway project begins today, with the former hoping that a High Court decision will stop initial works from commencing next month. The judicial review lodged by Lantau resident Ho Loy and supported by the Dolphin Conservation Society and People’s Aviation Watch, challenges the Environmental Protection Department’s issuing of an environmental permit to the Airport Authority. They were granted leave last February. Marine biologist Dr Samuel Hung Ka-yiu, who chairs the society and has lobbied hard against the plan since its inception, said he was optimistic that there will be a positive result. The challengers say there are two unresolved areas of the project’s environmental impact assessment (EIA) – airspace and habitat loss – both of which contain major, unaddressed issues. The team is pointing to a lack of immediate mitigation measures to compensate more than 650 hectares of irreversible habitat loss, mainly to the Chinese white dolphin, offering instead an enlarged marine park when the project is complete in 2023. The report was also said to have “written off” cumulative impacts from major infrastructure projects nearby such as future reclamation works off Lung Kwu Tan and the Hong Kong-Zhuhai-Macau Bridge’s artificial island. Another point in their crosshairs was the authority’s floating of additional “enhancement” measures, unrelated to the EIA and not legally binding, to spruce up the project and put “icing on the cake”, said Hung. He believed this was a move to appease members of the Advisory Council on the Environment, which must endorse the report before it can be passed on to the director of environmental protection for the stamp. The challenge will also raise issues with the assessment of noise and air quality impacts, which was based on assumptions that airspace issues with the mainland would be resolved. Hung claims a victory for his group may render the authority’s environmental permit null and delay the project. The legal team, led by Senior Counsel Nigel Kat, will cite the KCRC Corp’s HK$7 billion bid to build a rail rink through the Long Valley wetland, which was rejected by the EPD in 2000 on grounds that the operator would not be effective in compensating habitat loss. A subsequent appeal was also turned down. But a defeat would mean initial reclamation works for the HK$141.5 billion runway and the collection of fees from travellers to pay for it will begin as planned on August 1, an outcome they believe would set a precedent for exploiting the EIA system. “In the future, anyone will just submit a lousy EIA, ignore everyone’s comments, and then propose enhancement measures to get the approval,” Hung said. A spokesman for the authority declined to comment as the case had entered judicial proceedings. It would be necessary for Hong Kong to allow mainland authorities to administer its airspace if the airport’s third runway is to be built, an aviation official told lawmakers. Members of the Legislative Council’s subcommittee on the third runway yesterday expressed fears that issues arising from a new runway would be a repeat of the Express Rail Link co- location immigration arrangement, as the transport chief refuses to make public arrangements on airspace. When the third runway is built, the number of flights per hour would increase to 102, and it would be inevitable for Hong Kong to let mainland authorities administer some of its airspace, said Samuel Ng, senior evaluation officer of the Civil Aviation Department. The arrangement is in line with the Basic Law and international standards, Ng said. Lawmaker Kenneth Chan Ka-lok said Hong Kong people may not feel comfortable with letting mainland authorities administer their airspace. Legislator Lee Cheuk- yan said the biggest problem is that lawmakers have no idea about what agreement the SAR government reached with its mainland counterparts. “I can smell the scent of the Express Rail Link,” Lee said. Ng said the airport has once reached its highest capacity of 68 flights per hour last winter, the main constraint is the safety distance between aircraft required by the International Civil Aviation Organization. Ng said delegation of airspace conforms with regulations of the ICAO, and is a common international practice, giving Singapore and Malaysia as an example. The arrangement conforms with the Basic Law and will not involve the allocation of civil aviation airspace from the SAR to other jurisdictions. Secretary for Transport and Housing Anthony Cheung Bing-leung said the plan on air-traffic management by civil aviation authorities of Hong Kong, the mainland and Macau took the third runway into consideration. “The plan involves many technical details of other authorities. We cannot reveal those by ourselves,” Cheung said. 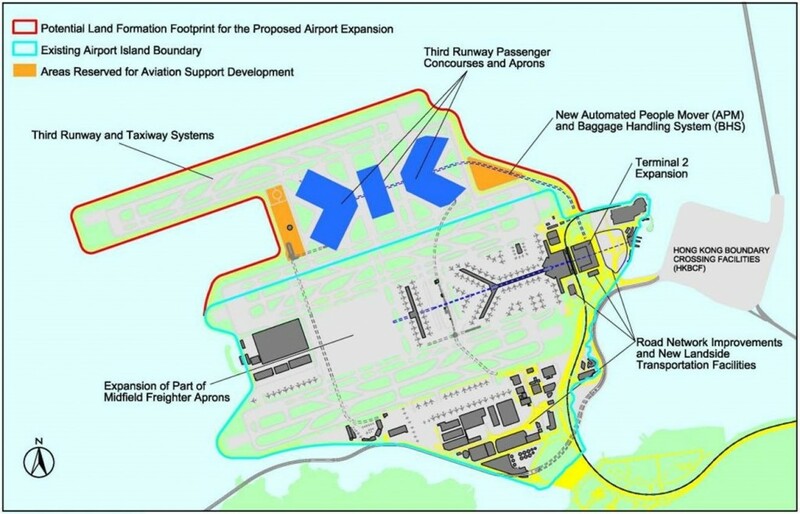 In February this year, the Town Planning Board completed its review of the draft outline zoning plan supporting a three-runway system at Hong Kong International Airport and agreed to submit it to the Chief Executive in Council for approval. This will pave the way for the implementation of the three-runway system which is essential to meet our long-term air traffic demand. Many opinions were heard during the board review meetings, some of which were misconceptions that have unfortunately persisted despite attempts at clarification. The Civil Aviation Department would like to address some of these. Fact 1: To meet safety requirements, the maximum capacity of Hong Kong’s existing two runways is 68 flight movements per hour. Some commentators suggest that the maximum capacity could reach 86 movements per hour if airspace were better managed. This appears to be based on misinterpretation of the 1992 New Airport Master Plan. The master plan presumed that if the two runways were able to support an “independent mixed mode” – that is, two runways were used for both take-offs and landings at the same time, as if they were two independent airports – the maximum capacity of the two runways could reach 86 movements per hour. Nonetheless, the same report clearly stated that, fettered by the surrounding terrain of Lantau Island, it is impractical for the two runways at the airport to adopt this mode of operation due to incompliance with the safety requirements of the International Civil Aviation Organisation, particularly in relation to the safe distance to be maintained between aircraft during take-off and landing. In other words, the capacity of the existing two runways is constrained, and it is impossible for the two runways to reach 86 movements per hour. Subsequent international consultancy studies reaffirmed this. Let me draw a comparison with a train station. If there are only two platforms at the station and the trains have to operate at a fixed time interval at each platform, the maximum number of trains that this station can operate is constrained. Without a new platform, the number of trains to be operated by this station will never go beyond the limit, even if more tracks are built to connect this station with other stations. The same applies to the two runways at the airport. Only by building an additional runway can we greatly enhance the number of aircraft movements. Fact 2: Removing some hilltops on Lantau Island will not enhance runway capacity. There were views that capacity of the runways could be boosted if the peaks of two small hills on Lantau could be removed. This misconception again probably stemmed from the 1992 master plan. While the report mentioned removing the peaks of two hills, which were 610 and 810 feet high, the suggestion was made in connection with possible options of lowering the climb-out gradients for departure aircraft in case of engine failure. This has nothing to do with runway capacity. If we were to alter the surrounding terrain for the sake of increasing the capacity of the runways, most of the high peaks on Lantau Island would have to be levelled to satisfy the relevant safety requirements of the International Civil Aviation Organisation. This would mean forgoing the Ngong Ping cable car, Big Buddha and Po Lin Monastery and a part of the Lantau country parks, which does not appear acceptable to the public. Fact 3: Claims that flight tracks between Hong Kong and Shenzhen will be in conflict are unfounded. As early as 2004, the mainland, Hong Kong and Macau set up a tripartite working group to formulate measures to rationalise airspace structure and air traffic management arrangements in the Pearl River Delta region to optimise the use of airspace and enhance safety. The three sides jointly established a plan in 2007, which took into account the operational needs of a three-runway system in Hong Kong as well as the development needs of Shenzhen and other major airports in the region. Progressive implementation of the plan will not lead to any conflict between the flight tracks of the three-runway system and that of Shenzhen airport (or any other airports in the Pearl River Delta). I have seen a graphic depicting the existing flight tracks of Shenzhen airport together with the flight tracks of the future three-runway system, suggesting that the flight tracks are overlapping and unsafe. We treat this kind of misleading accusation very seriously as there is absolutely no question of the government compromising aviation safety in any manner. Fact 4: Shared use of airspace complies with the Basic Law. Some people have alleged that the shared use of airspace between Hong Kong and Shenzhen may violate the Basic Law. This is absolutely groundless. As a matter of fact, the International Civil Aviation Organisation has been advocating that air route structure and air traffic management efficiency, instead of national boundaries, should be the prime considerations in planning airspace. Such airspace management is a common international practice, for instance between Singapore and Malaysia, and between Germany and Switzerland. The High Court earlier rejected an application for a judicial review in relation to the three-runway system . The complaint that the implementation of shared use of airspace under the plan would breach the Basic Law was considered not reasonably arguable. The court also considered that even though the Civil Aviation Department would permit the mainland authority to utilise a small portion of Hong Kong airspace to facilitate air traffic control, and vice versa, the ownership of the concerned airspace would still belong to the original civil aviation authority. The State Council issued a guideline on March 15 on promoting co-operation within the Pearl River Delta region which clearly stated that the central government supports the development of a third runway in at the Hong Kong airport, to reinforce the city’s position as an international aviation hub. I hope that this article can help dispel misconceptions.